When I have friends in town… visiting the top-tier historic sights such as the Aya Sofya and Topkapı Palace is a must, of course. However, I also like to take guests on walks through Istanbul’s varied, vibrant neighbourhoods. From the chic boutiques of Nişantaşı, to the bustling market and nightlife of Kadıköy, to the families thronging the holy sites of Eyüp on weekends; Istanbul is veritably many cities, rather than just one. For a great view of the city… you can’t beat the rooftop of the towering Marmara Pera hotel, where there’s a swanky bar and incredible cityscape panoramas. It’s sure to impress visitors, but when I’m with local friends, we head to nearby, more laid-back terrace bars. The Adahan Hotel, or the charmingly shabby Büyük Londra Hotel, are fantastic for a low-key sundowner. I’m also very partial to the surprising, delightful glimpses of the sparkling Bosphorus and Marmara Sea as I wind through my hilly Beyoğlu neighbourhood. When I need a pick-me-up… there’s no better (or cheaper) cure than hopping on the ferry crossing between Istanbul’s European and Asian sides. The 20-minute ride provides sea breeze, spectacular views, fresh air and the soothing motion of the waves – never failing to dispel the stresses of big-city life. Sit outside, order a cup of tea from a roving vendor, and keep an eye out for dolphins! My nights out in Istanbul… are usually pretty chill, often centred around the same small alley that’s home to both my favourite bar, Urban, and one of my favourite places to eat, the uber-casual (but beyond delicious) Çukur Meyhane. When my friends and I want to take time over a sumptuous meal and a bottle or two of wine, the city also has a glut of stylish restaurants to choose from. 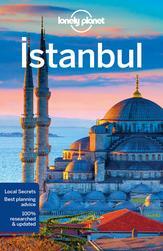 Aheste, Karaköy Lokantası, Yeni Lokanta and Karaköy Gümrük are among our top picks. For cheap eats… it’s important to know that all kebabs are not created equal. Sure, you can grab a cheap, greasy döner almost anywhere, or you can choose to gift yourself and visit Bereket Döner. Here, fresh succulent slices of lamb are immaculately hand-stacked each morning on the glorious rotating spit, interspersed with chunks of tomatoes and peppers whose juice tantalisingly flavours the meat as it cooks. And most dürüm (wraps) can’t hold a candle to those at Dürümzade, where the skewered meat is cooked to perfection, thin-sliced onions are dusted with sumac and the fresh lavash (flatbread) seasoned on the grill. A great weekend in Istanbul starts off with… a leisurely Turkish breakfast at Van Kahvaltı Evi, Cafe Privato or somewhere else serving serpme kahvaltı: a table-filling selection of small bites to share. The bountiful spread involves olives, jams, honey and thick cream, eggs with spicy sausage, roasted red peppers, slices of cheese and cucumbers, seasonal fruits, fresh bread… and endless little cups of black tea to wash it all down. When I have free time… I like to make the rounds of the local art galleries and cultural centres in Beyoğlu, to take in the latest shows at Arter, Mixer, Depo and SALT Galata. Fall is usually the best time of the year for art lovers, with the Istanbul Biennial and Design Biennial (in alternating years), the FotoIstanbul festival in Beşiktaş, the Contemporary Istanbul Art Fair, open studio days and tons of gallery openings and exhibitions to indulge in. I’m not much for shopping… but I love poking through the stacks and bins at the sahaflar (second-hand book dealers) in Aslıhan Pasajı near İstiklal Caddesi and the Beyoğlu fish market. Even if you’re not looking for English-language reads, the variety of ephemera for sale – vintage magazines, postcards, ages old black-and-white photos, weathered maps, classic printed advertisements and the like – is fascinating and can make for quirky souvenirs. The Istanbul Modern museum shop and the playful stationery store Kağıthane are my top go-tos for gifts. I’m a runner… and that’s still kind of a weird thing to be in Istanbul, although the activity is on the rise. My weekday running routine takes me to Maçka Park, a small but gloriously green oasis amidst the city’s concrete sprawl. On weekends, the panoramic European coastline of the Bosphorus, north of Bebek, is the most popular running strip. But I find an urban run from Karaköy to Sultanahmet – taking in the glittering sea views, city developments, crowd-watching and historic monuments alike – oddly exhilarating. One thing I don’t like about Istanbul… is the constant construction, filling the city’s streets with noise, trucks, dust and debris. The congested traffic and often unscrupulous taxi drivers are also high on the list of pet peeves for most Istanbullus. When I want to get out of the city… I head for the vast Belgrad Forest and track north towards the Black Sea coast with my running group, or to other outskirts areas of the city with a pack of adventurous urban hikers. Any green space close to a parking lot is often packed with picnickers, but once out on the trails, it feels as though we have a largely undiscovered landscape all to ourselves. A day trip by ferry to the beautiful, car-free Princes’ Islands is always blissful too – just as long as you don’t try it on a holiday weekend when everyone else has the same idea.